Prepare for a post-AppMenu world! Boxes already presents quite a few buttons on the top right side of the header bar, but we don't ship a hamburger menu in the main window. Another topic we need to discuss is whether the "Help, and About" options would be presented in the hamburger menu which we present in the display view (When you are viewing a VM). There is an ongoing migration from AppMenu to the app window. See https://wiki.gnome.org/Design/Whiteboards/AppMenuMigration Boxes already presents quite a few buttons on the top right side of the header bar, but **we don't ship a hamburger menu** in the main window. ! [header bar](https://i.imgur.com/7GQjrWL.png) Cluttering the top with one more button might not be the best idea. I suggest we merge the icon/list view switcher button with the hamburger button. These could be on top of the popover as linked buttons, for example (gnome-documents): ! 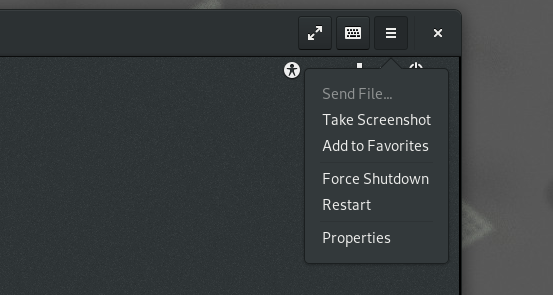 [How it looks like in gnome-documents](https://i.imgur.com/QOOYYCC.png) Another topic we need to discuss is whether the "Help, and About" options would be presented in the hamburger menu which we present in the display view (When you are viewing a VM). ! (https://i.imgur.com/5AgSpiI.png) Thoughts @jimmac and @aday?